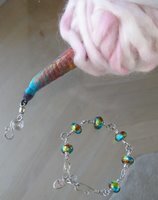 We're in the process of getting ready for our first show of the season; Madrona Fiber Arts. It is a fun show. For any of you who live in the Seattle area, please come by and see us. This show is held in Tacoma, and is definately worth attending. One of the things I love about this show is the amazing classes - and I'm taking 5 of them this year (yes, perhaps I've gone a little around the bend, but we knew that anyway - right?) Klaus will be manning the booth, and I'll be off playing. Now doesn't that sound like a fabulous gift from him to me! This class suggests that we bring our patience, for it involves knitting mittens with 11 balls of yarn! I'm excited to meet her in person! I have a couple of ideas about what I will do with this technique - but that's a surprise for the future. I've taken spinning classes with Judith before, and they are without a doubt the absolute best. I would pretty much take any class that she's teaching. If you ever have the opportunity to take a class with her, just do it! I just bought myself the new Alice Starmore book and there are at least 4 sweaters in it that I want to knit. I'm hoping to learn an easier way to manage two colors at once while I'm in this class. I've got all my supplies together, and done all my homework. I'm set (I think).. perhaps all except for the part where the "Mittens of Rovaniemi" calls for "expert" knitting ability ! I will be sure to bring along my humor. We're taking along some wonderful new products to this show - many new fiber blends, and several items that have been hand made by local artists. For example... 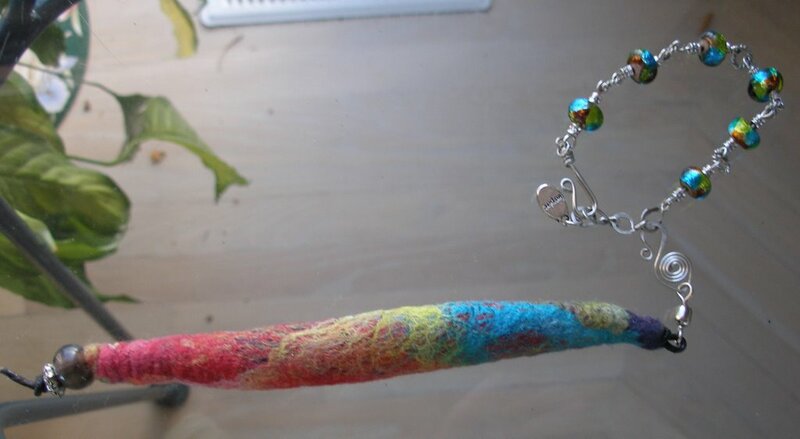 I was gifted with this cool handmade wristaff at Christmas time from my friend Beki (sadly blogless). What's a wristaff, you ask? 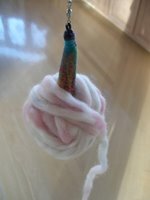 It is a spinning tool used by drop spindlers. 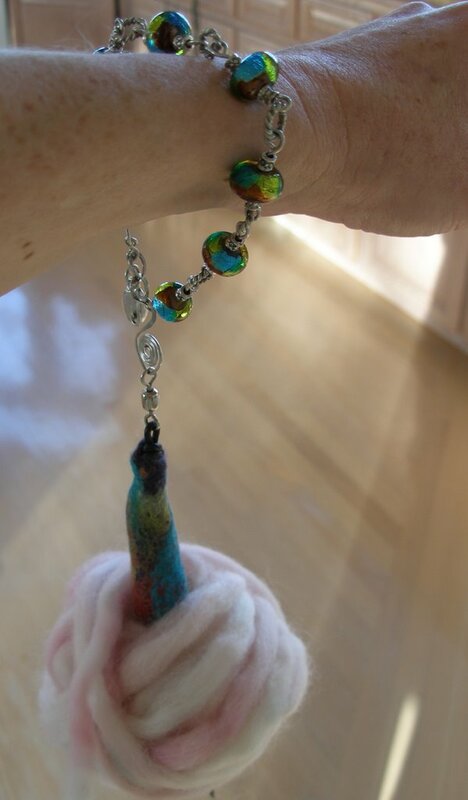 It hangs from your wrist, and holds the fiber out of your way when you spin on a drop spindle. This particular on e is very clever. 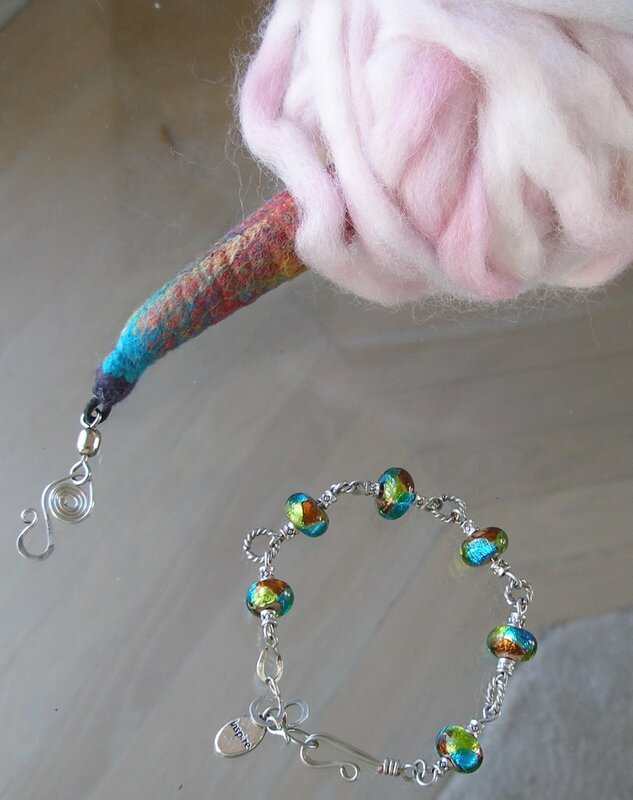 Beki has made a bracelet of silver and spectacular glass beads, and then hand felted the bottom part that holds the fiber. like this.. see? Now here's the cool part: the bracelet is detachable! So not only do you have a marvelous tool, you have a lovely piece of jewlery as well. On the knitting front, after my epic shawl project (which I will be proudly wearing at the fair) I have been finishing up my sock "mates" from all the single socks I made last year out of the Sock Hop Yarn. 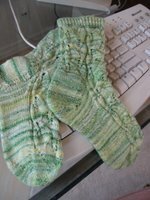 (and yes, I'll be wearing all of those as well- cozy toes!) 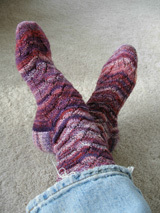 Two pairs complete, and a third 'second sock' is on the needles. See you in a week or so! Tally ho! Looking great there on the lonely socks reduction. Have fun at the festival. Stay warm. All those courses sound wonderful. But 11 colours! Whoa. Looking forward to seeing what you create with all this "new knowledge"! Have a great time Teyani! Have a great time! The classes sound fabulous. I've had (and loved!) classes with Sally Melville. She's a fab teacher. Hi Teyani- now that Mom is back in NY, I can catch up on reading all my favorite blogs!! It sounds like the fiber fest is going to be grand! Fun classes - and wow - Klaus is a keeper! Wishing, as usual, that I could be there too! The wristaff is too cute, and the socks are just divine! Looking forward to seeing you at Madrona. I'll be in Judith's class with you. I can't wait to hear about Susanna's class. I'm hoping she'll teach it somewhere in Seattle again soon so I can take it. Wriststaff is very cool. And nice looking socks. Congratulations! And Have fun! That sounds like an amazing retreat -- people always rave about Judith's classes -- I'd loe to take one with her someday. Very cool wristaff -- hmmm . . .
Have fun!! Love that last sock picture! It looks like your taking some great classes! I took a workshop with Judith and I learned alot she's a fascinating women. Have a great time! See you at the Fiona Ellis class. I can't wait to meet her as well. This is my first time to Madrona so I am really looking forward to it. Wow, such a neat line up you have going! I'm wish I could just take one ;-) Hope you have a lovely time. all of those classes sound amazing! can't wait to hear your reviews and projects from them...mittens with how many balls of yarn????? bring the ziplocs! You've signed up for a brain explosion weekend! So many informative classes. Wish I could be there. Hope it's a great festival for you! The classes sound fabulous! Have a great time and try not to buy too much yarn.